Get always connected to all your Blackberry contacts with TM’s (Touch Mobile) unlimited Blackberry chat promo. For only P15 you can now enjoy unli BBM plus 100 texts valid for 1 day. This promo is available on both TM &Globe prepaid and postpaid subscribers. 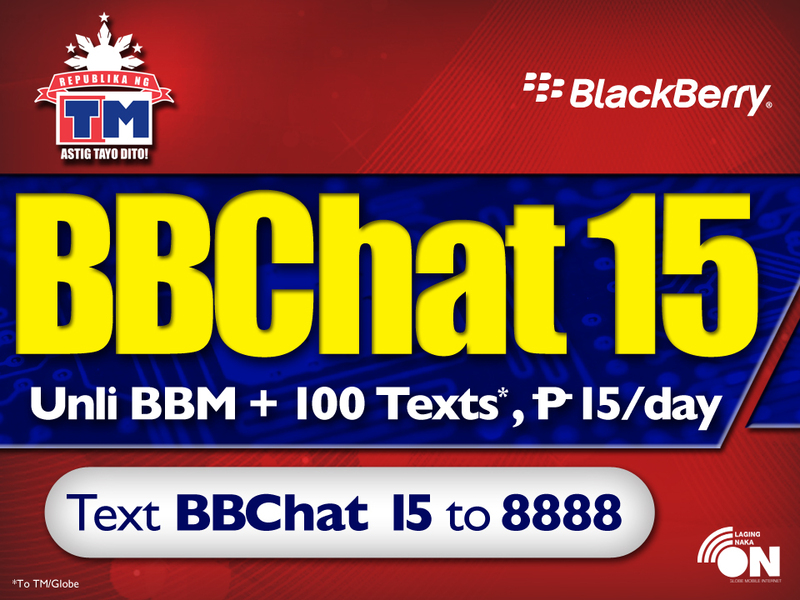 To register on TM/Globe unlimited Blackberry Chat for 1 day, just text the code or keyword below. For complete list of TM and Globe Blackberry Promos see BB Chat, Max, Messaging and Social. Is BBMAX599 available on Touch Mobile Sim? CAN I USE BB CHAT 99 IN TM? hi can i use bbchat15 on my bbz10? does this work on BlackBerry 10 os devices? like the q5 and q10?